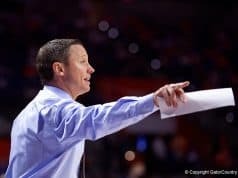 When they were actually able to get a shot up the Gators were extremely efficient on Saturday but egregious turnover issues were their demise as they ended up falling to the Auburn Tigers by a score of 65-62. Shooting 62% from the field the Gators were feeling it pretty well when the ball left their hand with a shot, but their major issue was getting to that point. They had 19 turnovers, a number that took any momentum they had out of the game and gave Auburn the chance to bomb away from the three point line, something they did really well going 13-30 (43.3%). 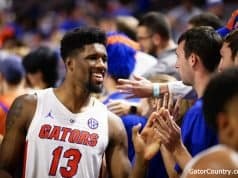 The sloppy performance with the basketball spoiled a great defensive effort by the Gators and ends their SEC Tournament run, and they’ll now wait for Sunday to see how they fair in the NCAA Tournament. This entire basketball can be summed up by looking at the turnover category with the Gators giving it up 19 times while Auburn only turned it over 4. That discrepancy allowed the Tigers to have 20 more field goal attempts than the Gators, a gargantuan number that allowed Auburn to launch lower-percentage 3 pointers with the free possessions they obtained. Turnovers have become a major issue for the Gators during the second half of the season and it was almost exclusively the reason they lost on a day they played well enough in a lot of other areas to win. Kevarrius Hayes (5), Andrew Nembhard (4), Jalen Hudson (4), and KeVaughn Allen (3) were the worst offenders when it came to kicking the ball around and I’m sure they’d like to have a lot of those plays back. Hudson was out of control on most of his drives and it ended in some awkward travels, Hayes fumbled a few passes on the inside, and Nembhard was too ambitious on a few occasions to try and force the ball to a cutter, all areas that need to be tightened up. When they weren’t handing the ball over to the team in the white shirts the Gators actually were hitting their shots, going 62% from the field and 42.9% from three. For a team that has been up and down it was good to see shots falling both on the outside and in the paint when they scored off cuts from their Princeton-style offensive sets. Perhaps most encouraging was seeing Noah Locke looking healthy in knocking down a few jump shots after he has looked to be totally hampered by injury the last few weeks. Auburn is a potent offensive team and I actually think the Gators did really well defensively against them. Yes, I know Auburn hit some shots, well, a lot of shots, but they were almost always well contested by the Gators. 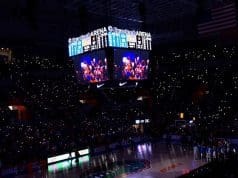 Florida did much better at cutting off the dribble penetration Jared Harper and Bryce Brown got in the first matchup and that allowed the Gators to stay set in their defense and not get scrambled. Florida blew up several screening actions Auburn attempted and forced them into late clock scenarios, and Kevarrius Hayes was excellent as a rim protector. The elite shot making of Auburn might have made it appear like Florida wasn’t defending great but in my mind they did a great job. Okay, I can’t not talk about the egregious foul the referees missed on the final play of them game. With the score 65-62 the Tigers missed their second free throw, allowing the Gators a chance to tie the game with less than 7 seconds on the clock. The ball got pushed ahead to Andrew Nembhard who gathered and attempted to elevate, though he was swarmed by 3 Tigers who very obviously fouled him. I’m sure there were a lot of bodies blocking the play from the refs, because Nembhard’s arm was very obviously hacked and held as he tried to get a shot off. Florida’s turnovers made it so that they really didn’t deserve this game but their chance to tie was completely taken away by the officials and Andrew Nembhard should have been going to line to shoot three to tie. There were just too many low IQ turnovers today and when you kick the ball around as much as the Gators did you aren’t going to beat good teams. Florida’s turnovers allowed the Tigers to have way more possessions than the Gators and those extra shots could have made this game way worse instead of the one-possession contest it was. 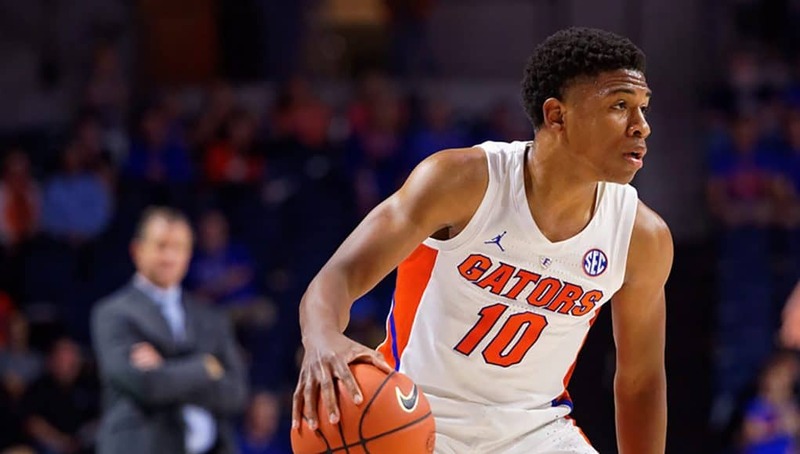 The way Florida handled the speedy Auburn guards defensively was encouraging heading into the NCAA Tournament but they’ll have to find a way to tighten up these turnover problems.